The only noteworthy species recorded on census were all lingering birds from previous days. The Sand Martin was still at Hooking Loch, the littoralis Rock Pipit was still in the north-west of the island, 2 of the regular Iceland Gulls were still present, and the Greylags still had 5 White-fronted Geese and a hybrid Greylag x Canada Goose for company. 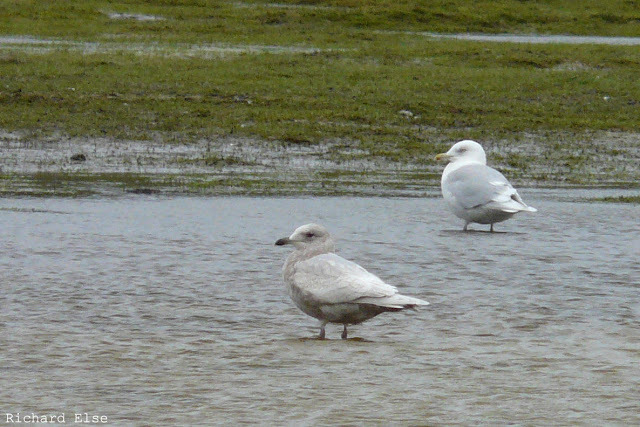 These Iceland Gulls have both been around for some time, and both have been pictured on this blog previously. 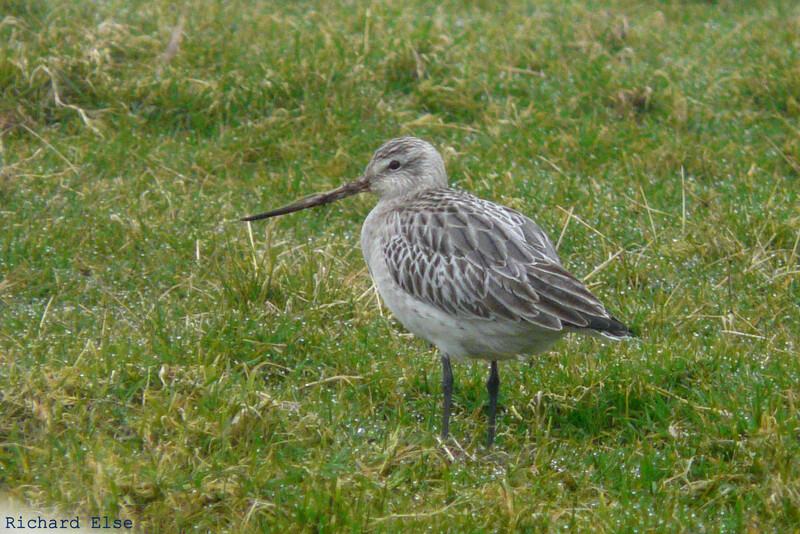 The immature bird was first seen on 6th February, the adult on 2nd March. A misty, drizzly, breezy day was hardly ideal for looking for birds, and little of note was found on the census rounds. A littoralis Rock Pipit was new and a couple of Wheatears were at the north of the island, but most other birds, including a Pink-footed Goose, 7 White-fronted Geese, a Hen Harrier, an Iceland Gull and a Woodpigeon, had been on the island for a few days or longer. 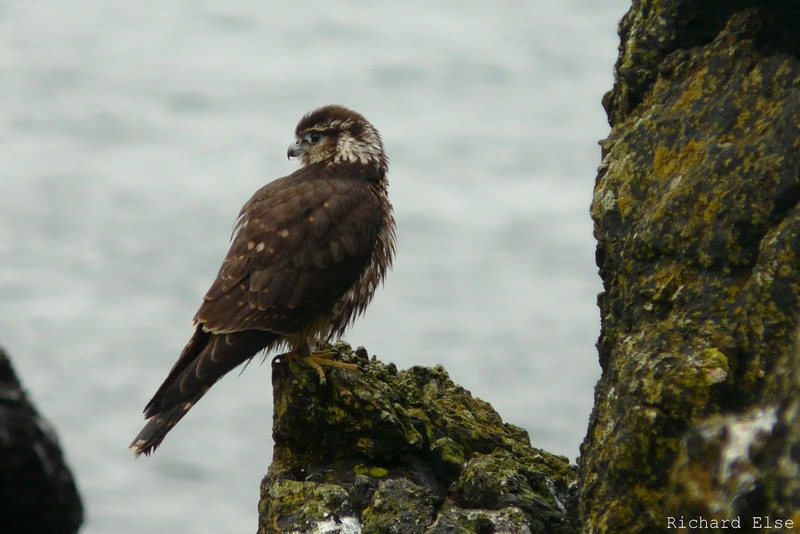 Merlins have been seen most days recently, including this ringed bird that has been present for several days. A return to more familiar and less unseasonably halcyon conditions still delivered a small number of new migrants. A Sand Martin was the most notable arrival: unusually early in the year, it was only the second ever March record of the species on North Ronaldsay. A few other small birds include 5 Goldcrests at Holland House, 22 Redwings, a Fieldfare, 2 Wheatears and a Robin. A couple of the usual Iceland Gulls were still around, as was the Woodpigeon, and 3 Sandwich Terns were seen. Although now almost expected here in late March and April, a White-billed Diver drifting north past the lighthouse was a welcome sight in the afternoon, and was just a day earlier than the one in 2011. More surprising, in a way, was the year's first Swallow, beating the species's earliest ever spring arrival date by 6 days. Also new for the year were a Puffin and a Common Redpoll, while other migrants included 6 Wheatears, 112 Meadow Pipits, 6 Rooks, a Siskin, a Jack Snipe, a Sparrowhawk and a Kestrel. The suncream got its first outing of the year during an entire day of warm and sunny t-shirt weather, rather unexpected so early in the year. 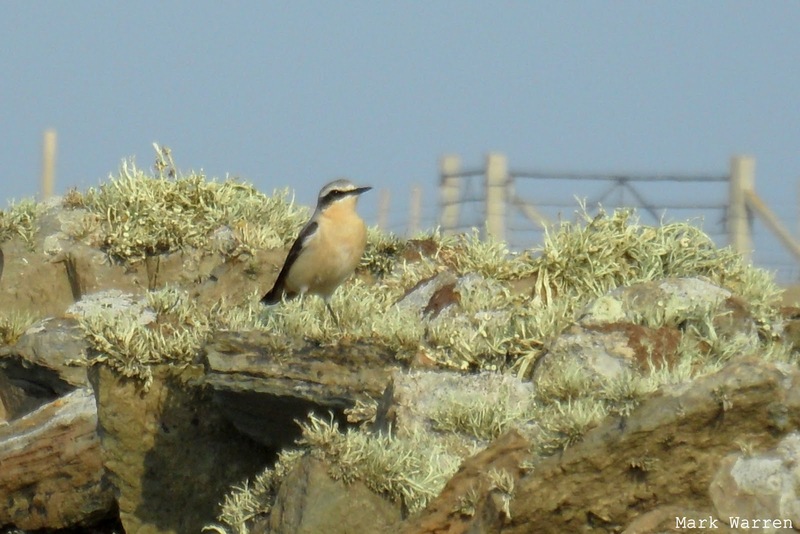 The year's first Wheatear arrived on cue to find conditions surprisingly similar to its recently departed African wintering grounds, but other new migrants were thin on the ground. A Siskin, 3 Goldcrests, a Chiffchaff, a Rook and a Robin were the best of the small birds; a Grey Plover was the most interesting non-passerine, although a Peregrine, 2 Merlins and a Sandwich Tern were also present. A Glaucous Gull was at the north of the island, and 3 Iceland Gulls included 2 lingering birds and a new first-winter. A notable record was a count of 18 Great Northern Divers, more easily visible than usual on the calm sea. More fog in the morning soon lifted to reveal a beautiful spring day, with further small numbers of migrants arriving and passing overhead in the sunshine. The first Black Redstart of the year was at the surgery, while other small migrants included a Siskin, a Chaffinch, 6 Goldcrests, a Chiffchaff, 22 Pied Wagtails, 29 Skylarks and the spring's first triple figure count of Meadow Pipits. A Kestrel, 2 Sparrowhawks and a Woodpigeon were also new, as was yet another Iceland Gull. The flock of Bar-tailed Godwits has been around Ancum Loch and Linklet Bay most days, and includes one bird wearing a Norwegian ring that first arrived here a year ago. A Crossbill flying over the island in the morning was the second earliest spring record of the species for the island, and the highlight from a day of constant thick mist. Other passerines were much the same, with similar numbers of Goldcrests, Meadow Pipits, Skylarks and Pied Wagtails, although 3 Chiffchaffs were seen during the day's census. A Woodpigeon, a Jack Snipe and 2 of the usual Iceland Gulls were seen; and the goose flocks still contained a Pink-footed Goose, 28 European White-fronted Geese and the single Greenland White-fronted Goose, as well as a newly arrived Canada Goose x Greylag Goose hybrid. The early stages of migration continued in warm and summery conditions, small migrants beginning to appear in slowly increasing quantity. 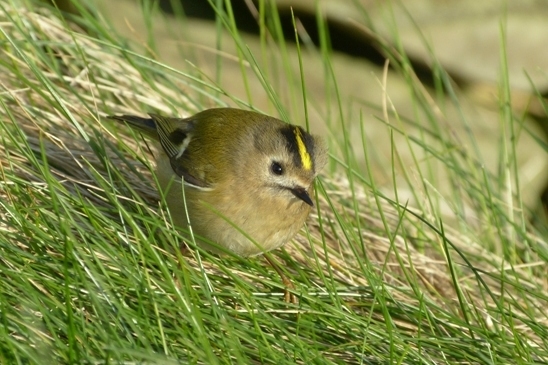 Goldcrests were clearly a species on the move, with 13 noted around the island, and other newly arrived passerines included the first Siskin of the year, a Rook, 2 Song Thrushes, a Robin, a Dunnock and a further increase in Meadow Pipits to 59 birds. A Water Rail in the unusual location of Holland House garden was presumably a new migrant, and the day's raptor tally came to 1 apiece of Sparrowhawk, Merlin and Peregrine. A Glaucous Gull was probably new; the only Iceland Gull seen was one of the usual long-stayers. A scattering of new migrants seen during a calm and bright morning census included the first Chiffchaff, Carrion Crow and littoralis Rock Pipit of the year. A Woodpigeon, 2 Song Thrushes, a Goldcrest, a Rook and another Chaffinch were also new, and a Hen Harrier was the first for a while. Another new Iceland Gull arrived, while the long-staying dark second-winter bird made another of its occasional appearances at Westness. A general amelioration of the weather brought a few new odds and ends, including more Skylarks, an increase to 33 Meadow Pipits and 8 Pied Wagtails trickling through in the morning mist. The first Bean Goose for a few weeks, thought most likely to be of the Tundra race, appeared among the remaining White-fronted Geese; and another new Iceland Gull, a first-winter this time, was found on the golf course. A Chaffinch was at the observatory, and 2 Peregrines were seen. Linnets continued to increase, reaching 24, while the number of Twites dropped further to just a couple of birds. Another breeding species rapidly increasing in number was Black-headed Gull: a count of 156, mostly at the Hooking Loch colony, was the highest of the year so far. 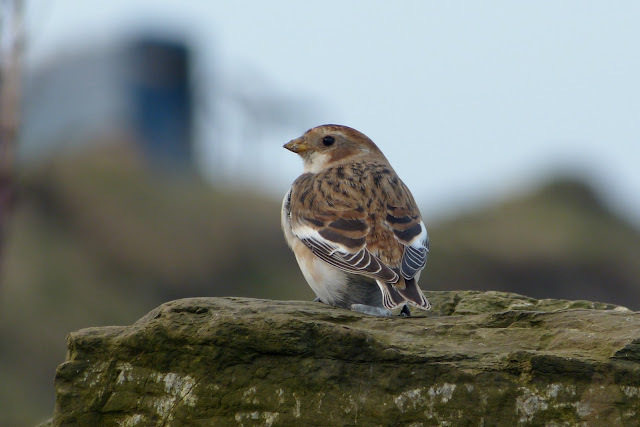 Snow Buntings have been noticeably fewer in number than this time last year, but one or two have been present around the coast . A miserable day on the 19th produced just a long-staying Iceland Gull and almost nothing new. The first day of spring - at least by the vernal equinox definition - on the 20th, was slightly brighter, and produced a new Peregrine and a new adult Iceland Gull in addition to the lingering individual. A Lesser Black-backed Gull was seen again; at least 5 White-fronted Geese were still present, although the wintering flock seemed to be finally dispersing; and there were 2 Sandwich Terns in Linklet Bay. 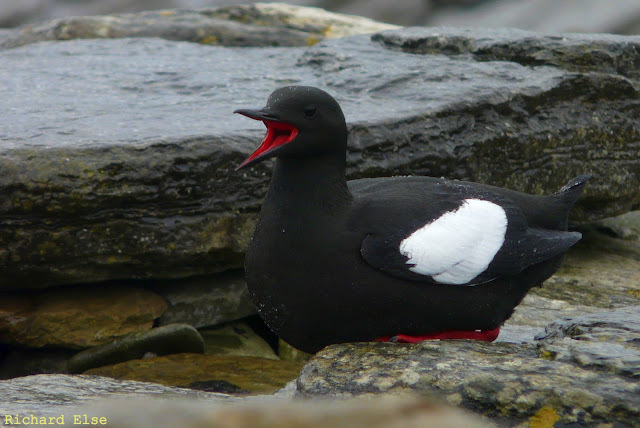 Despite the windy conditions, much greater numbers of Black Guillemots were back in the colonies around Twingness. A nice surprise so early in the season, and a welcome opportunity to give the red typeface its first blog airing of the year, was a drake Green-winged Teal lurking in the marshes at Hooking Loch in the afternoon. 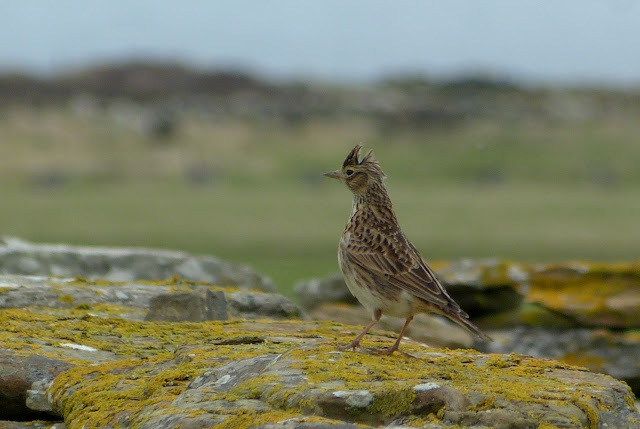 This is the seventh record of the species for the island, but the third in less than a year. A Sandwich Tern in Linklet Bay was also new for the year, arriving on a typical date for the species. Otherwise, a Lesser Black-backed Gull and the usual adult Iceland Gull were the only sightings to report. Two raptor species new for the year arrived right on cue during a very mixed day of sunshine and showers: a Sparrowhawk was on exactly the same date as the first record in 2011, and a Kestrel was one day earlier than the first record in that year. The only other new arrivals of note were a Rook and a small influx of 18 Linnets to the observatory's crop fields. 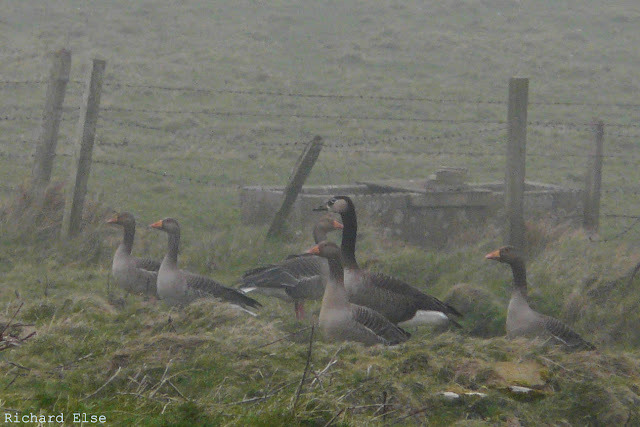 The Greenland White-fronted Goose was back with the European White-fronts and a Pink-footed Goose was seen again with the Greylags. 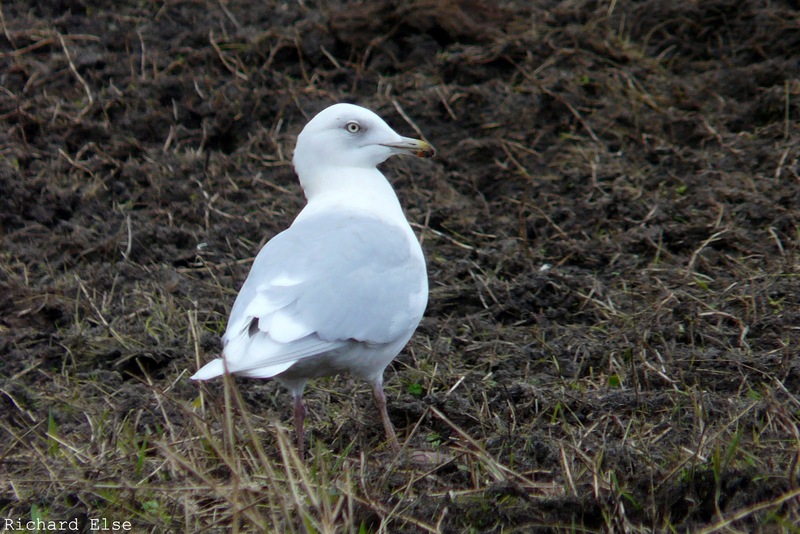 The year's first Lesser Black-backed Gull was the only different species recorded. The adult Iceland Gull, the Dunnock and 43 European White-fronted Geese were all still present. 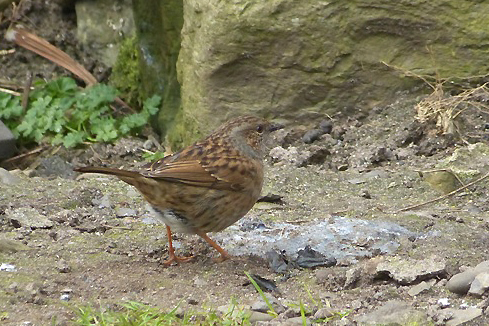 The Ides of March brought, most notably, the year's first Dunnock - a heartening sign in the Northern Isles that spring passerine migration is on its way. A couple of Meadow Pipits passed overhead with a small number of Skylarks, and at least 8 Pied Wagtails were scattered around the island. The day's Iceland Gull tally reached 4 different individuals, 1 of which was a new arrival, while a Jack Snipe was the best of the other non-passerines. There was nothing of note to report on the 12th and 13th, but the 14th saw the beginning of 2012's systematic migrant census of the island. The best of a sparse selection of new migrants were a Chaffinch and a group of 5 Rooks, although the latter were a new species for the year. Long-staying Iceland Gulls were at Gravity and Westness, and a third individual was roosting on Seal Skerry. A Pink-footed Goose was again with the Greylags, and 2 Pied Wagtails were seen. 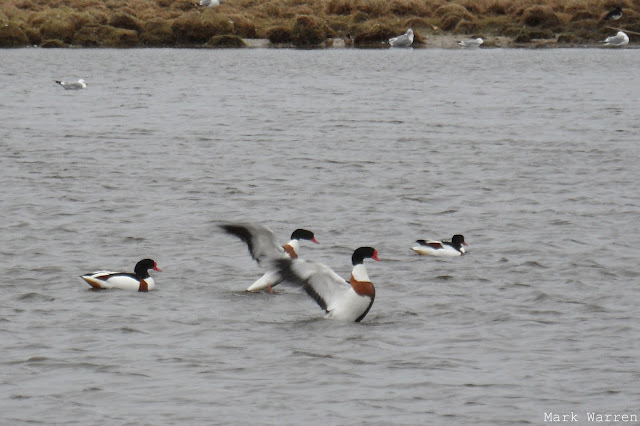 At least 12 Shelducks was an increase on recent counts. An adult Glaucous Gull at Bridesness Point on the 10th was the only new bird of interest. A Pink-footed Goose was with Greylags on the 10th, and the usual White-fronted Geese were still present throughout. 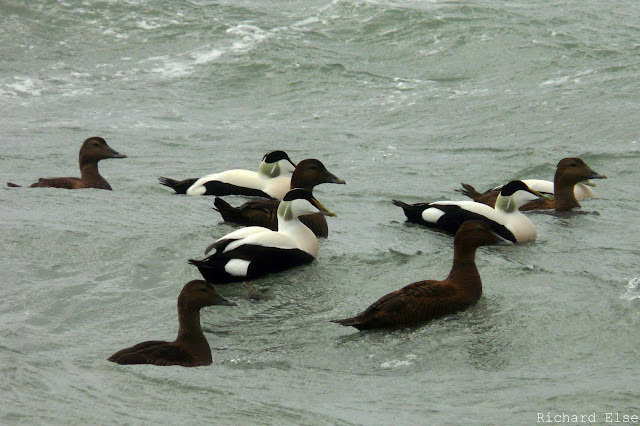 Although nothing unusual has been picked out from among the common species yet, good numbers of Eiders and other ducks around the coast are well worth scrutinising at this time of year. Most of this period was spent painting the guest house and hostel, so there were very few sightings to report. The only birds worth mentioning were seen on the 8th, when an immature Glaucous Gull, a Pied Wagtail and the long-staying 67 European White-fronted Geese were the highlights of a short morning census. On the 4th, the first Goldcrest of the year was at Holland House, 256 Skylarks were counted during the day and a Peregrine was another new migrant. Single lingering Glaucous and Iceland Gulls were still around, and the goose flocks contained a Pink-footed Goose and at least 63 White-fronted Geese, including the usual Greenland bird. The 5th was a pleasant day, but there was little to report besides a Pied Wagtail and reasonable counts of 20 Red-throated Divers and 6 Great Northern Divers seen offshore. At least 52 Skylarks were noted on the 1st, but there was little else of note on that day. The dark immature Iceland Gull was still around on the 2nd, along with a new adult, and another second-winter bird was seen on the 3rd. After a period of apparent absence, the Gretchen Loch Glaucous Gull returned to its usual spot on the latter date. Also on the 3rd, a Little Auk was in Nouster Bay and 4 Little Grebes had returned to Bridesness Loch. The flock of White-fronted Geese was present throughout.